On Saturday [Aug 31], 21 boats made their way to over 40 reef sites around the island to take survey of the state of the coral, color and quantity of specific types of fish. 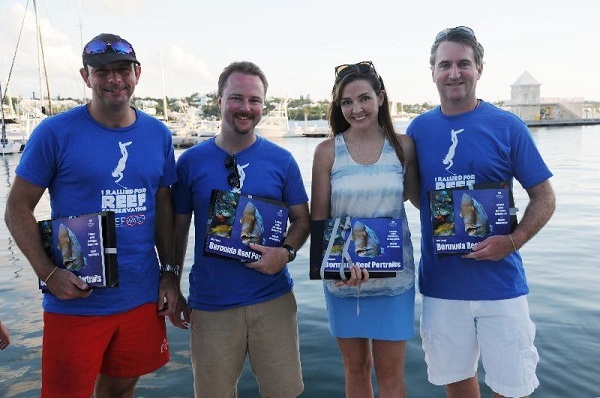 Teams of volunteers of BZS have raised more than $21,000 for coral reef research, funds that will help to continue the support of data collection and analysis. Team Faraway [pictured] was the top fundraising team, and were awarded prizes for their efforts. The event concluded with a BBQ for participants on the same evening at Barr’s Bay Park, where a preliminary review of the data was given by Dr. Thad Murdoch and awards were given to the top fund-raising teams. A spokesperson said, “Special thanks to all our participants and volunteers who made the event a success, our lead corporate sponsor, Hiscox, and the many other groups and companies that also supported the event: AZU Beastro, Endsmeet Animal Hospital, Bob Steinhoff & Family, [zac] Design, Barritt’s, Bermuda Blueprinting, BGA, Gosling’s, Graphix Signs, Groundswell, Harry’s at the Waterfront, Island Restaurant Group, Makin’ Waves, Marine Locker, Rosewood Tucker’s Point, Undercover Rentals and Wilk’s Catering.